The Sentiero Italia (SI) is an excursionist itinerary, long about 6.600 Km, across the entire Italian land. The travel, divided in 368 stops-over, leaves from Grotta Gigante in Sgonico, next to Trieste, and across the entire alpine chain, across the Apennine chain, Sicily and Sardegna till Santa Teresa in Gallura (OT), walking for long old trails like Grande Traversata of Alpi, Ligure Alta Via dei Monti Liguri and the Tuscan “Grande Escursione Appenninica”. Lorenzo is trying to follow in the less time possible, all itineraries, alternating fast walk and trail running. For this reason, he decides to travel only with some few necessary objects: a sleeping bag, food, torch and a smartphone to trace the way and to share his adventure. In this kind of situation, the Solar Power Station 10-50 is essential, 50Wh of accumulator to charge electric devices. In add, the lightness of the solar panel helps him considerably. Unfortunately, Lorenzo is not lucky. On 4th day the Lizard 50 falls down in the water. It is not waterproof and so, also if it works, its performance decreased. Lorenzo, not surrendered, continues to utilize Hippy 10 panel to charge directly his mobile phone, but after a little bit, also panel’s ribbon damage, compromising the operation and leaving the athlete with a little reserve of daily electric energy. What means “Ribbon”? And How utilize correctly the solar panels? 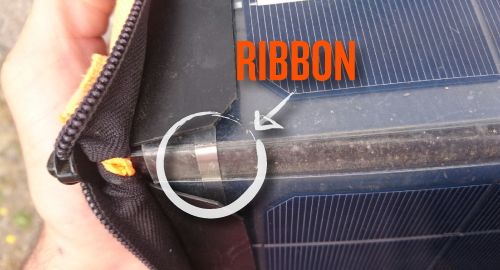 Ribbons are copper’s fibres (covered by tin and silver) visible on the solar panel’s surface. They are the electric energy’s conductors of solar panels. Lorenzo’s panel is damaged in central ribbons because of an excessive folding. PAY ATTENTION: The Hippy 10 mustn’t be opened more than 180°. Lorenzo, during these weeks, takes pictures and shares on Instagram the most wonderful scenes, especially during his journey in Sardegna. These pictures show his wonderful experience, especially for who, like him, love to undertake unpredictable adventures. On 5th June, the athlete, thanks to his obstinacy, arrives in Cagliari, where he founds our replacement of the Solar Kit and he boats for Sicily. Extreme Crew’s leaves Palermo, and through BuddyBeacon he’s able to trace and memorize it. BuddyBeacon is an application (mobile and desktop) that allows to follow Lorenzo, thanks a graphic interface with a map, elevation and velocity. Here you are the guide to follow Lorenzo in his Italia trail!